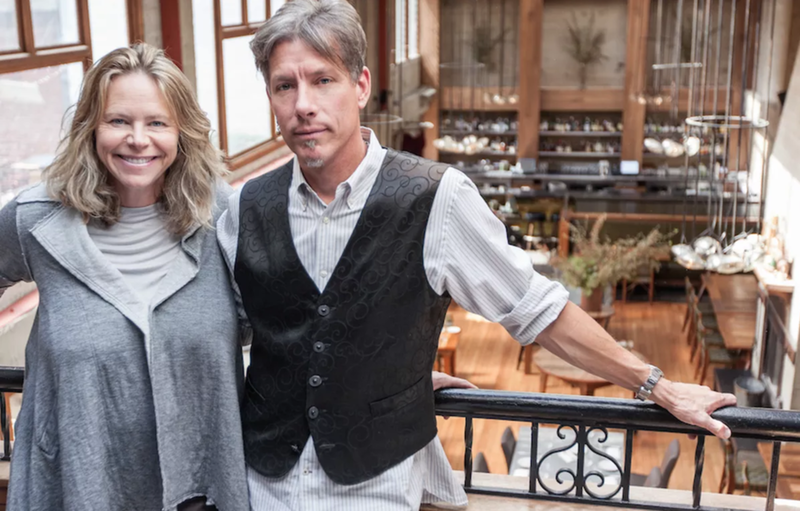 Chef/Co-owners of Foreign Cinema and Show Dogs Partners Gayle Pirie and John Clark are two highly original talents who have been deeply involved in the competitive and innovative ferment of the San Francisco restaurant scene for over two decades. Today, Pirie and Clark are the chef talent and owners behind two very popular and exciting dining destinations in San Francisco – Foreign Cinema and Show Dogs. The two met while working at the former Vicolo Pizza, a popular pre- and post- theater destination located in the Civic Center neighborhood. Later, Pirie and Clark were hired on at San Francisco’s legendary Zuni Café as line cooks and were promoted to co-chefs de cuisine shortly after, earning critical approval for the purity, quality and consistency of their food. The duo then developed a restaurant consulting practice to create restaurant concepts and designs for a diverse and adventurous set of clients in the United States, Asia, and Canada. They spent nearly two years in Hong Kong developing two new restaurants, and traveled widely in Europe and Asia researching locally produced and artisanal ingredients before returning to the states.In 2001, Pirie and Clark joined forces and took over the kitchen of Foreign Cinema where they implemented an ever changing California-Mediterranean influenced menu and full oyster bar, earning the restaurant three stars from the San Francisco Chronicle and eleven consecutive “Top 100” rankings. After ten years at the helm of one of the city’s most popular dining destinations, she and her partner are inspired to execute a different dining experience seven days a week. From the daily changing menu featuring seasonal ingredients to the flowers, décor, cocktails, and film, Foreign Cinema is an ever-evolving sensual dining experience. As San Francisco natives, they wanted to be part of the catalyst for re-vitalizing the mid-Market theater district to its former heyday and opened Show Dogs in 2009 in order to provide high-quality, organic food, along with locally brewed beers and biodynamic wines for the neighborhood.In addition to Foreign Cinema and their new ventures, they have published two cookbooks. Inspired by their affinity for eggs and the many ways you can prepare them, they published Country Egg, City Egg in 2000 and reprinted it in 2008 by popular demand. Bride and Groom, a culinary guide and cookbook for newlyweds, was published in 2006.Pirie and Clark live in Berkeley with their two children, Magnus and Pearl. Currently, the highly anticipated Foreign Cinema cookbook is in the works.